Kelly Rowland Collapses On Stage! 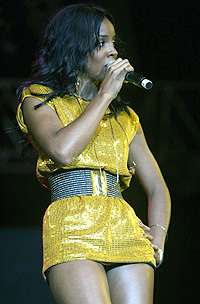 Kelly Rowland, former Destiny’s Child singer and solo artist, collapsed on stage early Sunday in Nigeria as she performed. She was taken to an undisclosed hospital for a checkup, and her rep said that dehydration was the culprit. She’s now reported to be “in good condition” and is expected to return to the U.S. today. Rowland, 26, was in Nigeria as part of the ThisDay Music Festival, which also featured Shakira, Rihanna, UB40 and others. She just released her second solo album, “Ms. Kelly,” this month.